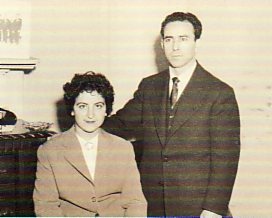 Above: The Zaharis family. 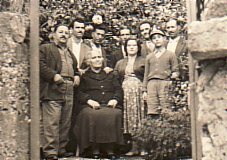 With my parents, Efterpi and Georgios, and brothers, Konstantinos, Panagiotis and Efstratios. Above Right: With my brother, Efstratios, at the panygiri of Agios Haralambos. Above: Skala Kalloni. With my brother Efstratios, and uncle, Ioannis Zaharopoulos (first and second from right respectively). 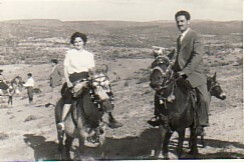 The couple on the left are Kostas and his wife. 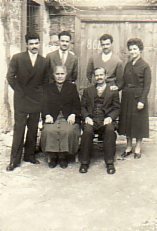 Above Right: My mother, Efterpi (seated) with my brothers and sybetheri. 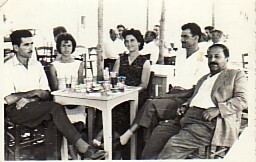 Standing are: my uncle, Ioannis Zaharopoulos; my sybethero Efstratios Tremoulas (Hatzikonstantinos); my brother, Efstratios Zaharis; my sybetheri, Paraschos and Dimitra Tremoulas (Hatzikonstantinos); my brother, Panagiotis Zaharis, my sybetheri Ioannis and Spyridonas Tremoulas (Hatzikonstantinos). . Above: With my fiance, Nikolaos Tremoulas, at our engagement party. 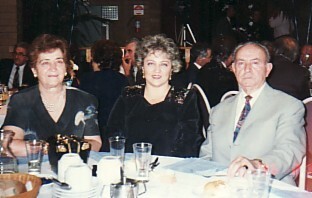 Above Right: With my daughter, Mary, and husband, Nikolaos.